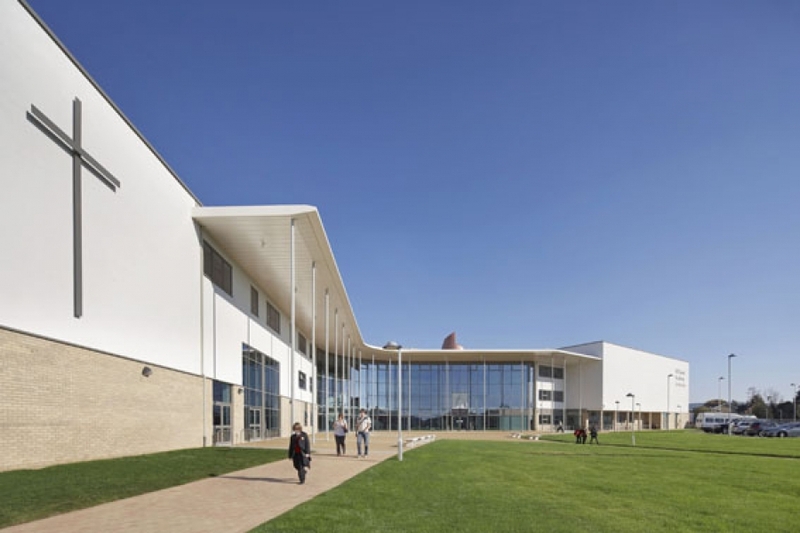 ACO Building Drainage has provided a whole range of drainage solutions for a £24m state-of-the-art academy school in Cheltenham that has since been nominated for a design prize by the British Council for School Environments (BCSE). All Saints’ Academy was designed by Nicholas Hare Architects LLP and was shortlisted for Best Secondary School project in the BCSE Awards for 2012. The Academy building has already been hailed as the most iconic school building in the South West by the local press. ACO’s highly praised work on the building resulted in a whole range of drainage solutions, including customised rainwater outlets for the roof, a bespoke tundish for the kitchen, and aesthetically attractive, corrosion-resistant Stainless Steel Modular channels and gullies throughout. The three-storey building in west Cheltenham provides secondary education for 900 pupils and 200 sixth formers, incorporating a 4-court sports hall, gym and dance studios at first floor level that are also made available for community use. Bishop Declan and Bishop Michael opened the Academy on All Saints Day, Tuesday 1 November 2011, cutting the ribbon in front of school staff, students and the entire design team. Olympic champion Sir Steve Redgrave opened the sports facilities. He described All Saints’ Academy as a fantastic school with absolutely stunning sports facilities. ACO Modular 125 channels were supplied and installed in the changing rooms, providing compact and attractive capacity drainage in corrosion-resistant stainless steel, while discreet drainage channels were specified for the external paving, supporting the need to maintain clean, functional design throughout the building. These products were specified from ACO’s Modular 125 Stainless Steel Linear Drainage range, a fully flexible system tested and classified to BS EN 1433 – Drainage Channels for Vehicular & Pedestrian Areas. In addition to the drainage channels, ACO gullies were supplied throughout, offering high levels of hygiene, durability and performance. All Gully systems are manufactured in austenitic stainless steel grades 304 and 316 and fully pickle passivated for corrosion resistance. The bowl-shaped design of the gullies minimises siltation and all models include an integral foul air trap. ACO solutions were specified in all corners of the building. For the kitchen ACO created a bespoke tundish (a funnel to collect combi oven waste water), while rainwater outlets were tailor-made for the roof.